PRETORIA, South Africa – A South African photographer is being honored for helping expose apartheid's brutality to the world with a picture that ended his career. On Wednesday, celebrated as Freedom Day in South Africa because it is the anniversary of the country's first all-race elections, President Jacob Zuma will bestow national honors on Sam Nzima for a photograph reminiscent of the "Pieta" he took showing a dying Hector Pieterson, a 13-year-old shot by police during the June 16, 1976 Soweto uprising. Nzima is receiving the Order of Ikhamanga, which recognizes South Africans who excel in arts, culture, literature, music, journalism and sport. He joins such past winners as jazz legend Hugh Masekela and novelist Alan Paton. Nzima said in an interview Wednesday his photograph seen around the world "tells the story of what happened. You don't even need a caption to see that something terrible has happened." 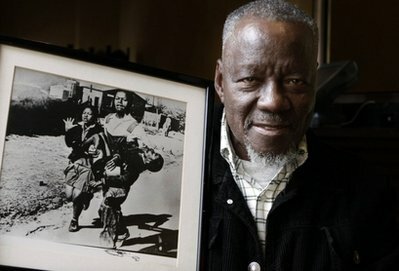 Nzima, 75, said police were so enraged by the attention his photograph drew, he feared they would kill him. He left Johannesburg and his newspaper to become a businessman in a small eastern South African town. But his photograph continued to draw attention. Nzima has spoken to students at a German high school named for Pieterson, and attended exhibitions that included his photograph in the United States, Briton and the Netherlands. Later this year, he will go to Belgium. Pieterson was the first to die from police gunfire after Soweto students were ordered to disperse. The students were protesting an order that black students to be taught in Afrikaans, the language of the white-minority rulers. Hundreds of blacks, many of them young people, were killed in ensuing clashes nationwide. Conflict escalated in the 1980s and finally led to apartheid's demise in the early 1990s. Nzima said he arrived in Soweto early that morning in 1976, assigned to cover what he thought would be peaceful protests. He watched students paint signs. "One said, "Afrikaans must be abolished.' Another, `We are being fed the crumbs of education,'" Nzima recalled. The marchers were confronted by a white police officer who told them he would shoot if they did not disperse, Nzima said. Instead, Nzima said, they began singing, "Nkosi Sikelel' iAfrika ," or "God Bless Africa." "That song, which is the national anthem today, was banned then," Nzima said. The police began shooting, and Nzima saw a boy fall. A tall boy picked him and began to run. Nzima took six pictures as the boy was taken to the nearest car, driven by a colleague from his newspaper, and taken to a clinic. There, he was pronounced dead and identified as Pieterson. Nzima, working at a time when restrictions on reporting on conflict were draconian, removed the film and hid it in his sock. Later, police forced him to expose film in his camera, but the photos of Pieterson were safe. "A lot of people ask me, why didn't I help Hector Pieterson?" Nzima said. "It was not my duty. A journalist must do his job. My job is to take pictures." And this picture, he said, made a difference. "This picture was an eye-opener for the whole world."